Zimbabwe is facing calls to be suspended from the international diamond trade following allegations of brutality by its soldiers. Rights groups are lobbying members of the Kimberley Process, the body which regulates the trade in rough diamonds, to halt exports from Zimbabwe. Activists say soldiers killed about 200 people at a diamond field. The government denies the claims. Kimberley Process members are holding a four-day meeting in Namibia. Namibia's government is a close ally of Zimbabwean President Robert Mugabe's Zanu-PF party, which is accused of profiting from the diamonds. The Kimberley Process, which has 70 members, was set up in 2003 to assure consumers that by purchasing diamonds they were not financing war or human rights abuses. Campaigners are warning that its credibility will be undermined if it fails to act against Zimbabwe. The country's Marange diamond fields were once used by local prospectors to gather diamonds to sell on the black market. But troops moved in late last year, and rights groups say they massacred about 200 people. One witness told the BBC how tear gas was thrown from helicopters and policemen opened fire at the diamond field. Another told how she was attacked by security forces during the crackdown. "I thought they wanted to beat me but they said: 'Today you're going to be our wife'," she said. "That's when I realised I was going to be raped." Human Rights Watch said the police and army have turned what was a peaceful area into a "nightmare of lawlessness and horrific violence". 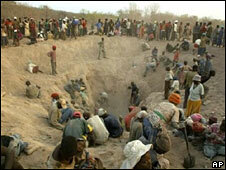 Activists say local people are now being forced to search for diamonds, with all the profit being taken by Zanu-PF. HRW insists the Kimberley Process should ensure diamonds are not mined in areas where human rights are being abused. But Mugabe sympathisers argue that the Kimberley Process is meant only to ensure diamond profits are not used to fund conflict, and therefore Zimbabwe should not be banned. Namibian MP Bernhard Esau, the current chairman of the Kimberley Process, told the BBC's Network Africa programme that Zimbabwe had "really serious problems" and needed help to remain "part of the family". He said there were problems with transporting the diamonds and fencing off the fields - suggesting that some "leakage" of the gems could occur. But he said he had been shown no evidence of killings when he had visited the Marange field. Some analysts argue that even if Zimbabwe were suspended, it would be almost impossible to prevent all the diamonds which are mined illegally from reaching the international market.